Take risks. Always be aware of the “brand” you’re projecting. And remember that sometimes, the best way to move your career forward is to do the unthinkable – by taking a step back. Those are just a few of the pieces of advice Wake Forest School of Business students, alumni and friends received during a Deacon Discussion with D. Steve Boland, head of consumer lending at Bank of America. 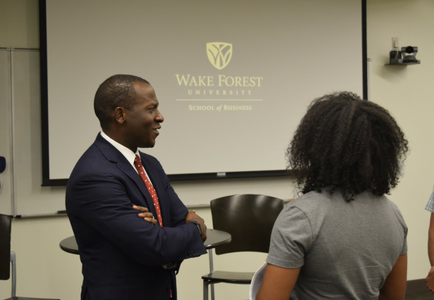 Boland spoke to a packed room at the Wake Forest Charlotte Center, sharing insights gleaned from his impressive career in financial services. It’s a career that by every measure would be described as successful. Boland began his work life in a Florida branch of a Bank of America predecessor bank and now heads a keystone operation of the Fortune 100 global giant. But, Boland told his audience, aiming for success means playing the long game. When you’re living it, not every move feels like it’s going to add up to something positive. Get too worried about seeming setbacks, and you’ll miss amazing opportunities, he said. Boland urged students to seek out mentors, but to make sure that those are people who will tell them the truth – not just be a source of untampered admiration. “You want advice and guidance, but you don’t want somebody who’s going to make you feel good,” he said. Those aspiring to grow their careers also should put themselves in the paths of potential sponsors – people with enough capital in the company to advocate for you. You can’t ask someone to be your sponsor, Boland said, but by carefully managing your reputation – your brand – you may find someone willing to serve in that role. Boland urged audience members to be aware of the image they project. “What do you get known for? Are you a person who can deliver? Are you known as someone with intellectual honesty?” Boland said. Watching the image you project is especially key when taking on a new challenge. Audience members asked Boland how he balanced his personal life with a dynamic career, with its many cross-country moves. It’s not easy, Boland conceded. “It takes tremendous discipline” to put aside the email and focus on family time, he said. And along the way, he’s committed to being there for important moments, by doing things like flying home for a school performance and then flying back to the meeting he’s attending. For support during the moves, Boland credited his family – his wife, Katrice, and two of his three children, Gabby and Luke, were in the audience – and said that he turned down some opportunities when they weren’t right for the family. Tim Reynolds, who works for United Technologies and plans to begin the evening MBA program in August, said Boland’s advice about being deliberate as you chart your career resonated with him. Invest in relationships. Networking “never ends,” said Boland. Moving around geographically expands that network even further. Have regular, clear conversations with your boss about your career aspirations. Humility helps. Especially if you become a leader, recognize that the people working for you probably know a lot more about what’s going on than you do. Spend time learning. Amber Veverka is a freelance writer based in Charlotte, N.C.